If a gold mine was a hockey team, the forwards would be production, piling up ounces like goals on a scoreboard. The costs per ounce are like defencemen: solid, predictable, hardworking but rarely getting the glory. While production numbers usually drive the share prices of mining companies, it’s cost control that keeps the company in the game with positive earnings. While retail investors are often impressed by high-grade mines that crank out the ounces, they should realize that gold-mining is like any other business: revenues must exceed costs. Mining costs rose steadily through the 2000s which should have hurt a lot of gold miners. But it didn’t. In 2001 when the gold price was just $272/oz, gold mining companies had cash costs of $176 an ounce, giving a 54% margin. However, by 2006 the gold price climbed into the $600 an ounce range and miners were losing money. Fast forward to 2012, when the average cash cost was $719/oz – 184% higher than 2006. Working with the World Gold Council, senior gold companies came up with a new standard to measure costs: all-in sustaining costs (AISC). AISC includes not only the direct costs to mine gold (machinery, processing, power, labor, etc. ), but G&A expenses, exploration, reclamation and sustaining capital. It does not include project capital, dividends, taxes and interest payments. Even so, AISC considerably tightened gold companies’ margins. Of the seven large gold firms, the average AISC in 2012 was $1,046 an ounce, but the gold price was sitting at a very healthy $1,675 at the start of 2013 – yielding an average margin of 60%. However, 2013 was also the year the gold price slid to $1,233 – a drop of over $400. At this point gold miners entered a period of pain; many sold assets, cut staff and took billion-dollar write-offs on properties as their stock prices plummeted. The point is, costs matter. And they’ve continued to go up. According to New York-based CPM Group, margins have squeezed as all-in sustaining costs have grown 22% since the gold price bottomed in 2016. Production numbers from gold mines are meaningless if costs aren’t given. Investors need to understand some of the factors that go into gold mining costs, so they are able to ask the right questions and break down these costs, in order to dive deeper into the total AISC that is usually given. These include: depth of deposit; strip ratio; open pit vs underground; labor; infrastructure; and recovery method. Of utmost importance to the cost of extracting gold is where the gold lies within a deposit. A deposit of disseminated gold (small particles of gold distributed throughout the rock) close to surface will be open-pit mined, while gold found in often-thin veins hundreds of meters below surface is mined using underground methods. There are many more low-grade gold deposits than high-grade. For every 2.5 grams per tonne (g/t) gold deposit, Mother Nature forms another 10 deposits around 1 g/t. Generally speaking, one gram per tonne works for open-pit mines, but underground gold mines require at least 2.5 g/t to be economic. Open-pit mining is either done with a fleet of haul trucks (some now automated) or an in-pit crushing and conveying system (IPCC). Underground mines are accessed via a shaft or ramp. Miners extract the ore through various methods using specialized equipment that operate in narrow, dark tunnels. Two of the deepest (and hottest) mines in the world are in South Africa: East Rand and TauTona. The most famous of the world’s shallow deposits is the Carlin Trend in Nevada. Here microscopic gold is found in almost every rock. The gold is low-grade (under one gram per tonne) but plentiful. Between 1835 and 2008 a whopping 152 million ounces was pulled from the Carlin Trend and other gold trends in Nevada, including Cortez and Walker Lane, mostly through open-pit mining. Some Nevada pits are now depleted and have moved underground. The technique of heap leaching – wherein mining companies pile ore onto large piles and irrigate them with leachate – originated in Nevada where near surface ore is oxidized. The leachate percolates through the ore, thereby dissolving the gold. While heap leaching for metals has been known about for hundreds of years, it wasn't until 1969 that the first gold and silver heap leap operation began at Cortez in Nevada. 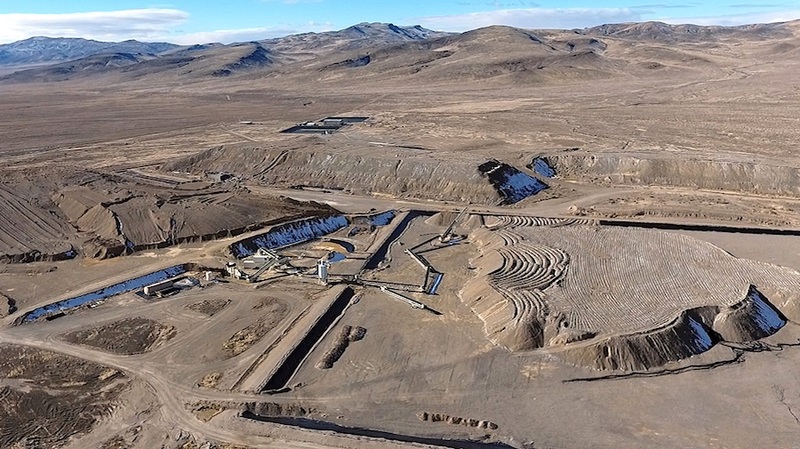 Barrick Nevada's Cortez property is still going, with ore drawn from the Pipeline complex open pit, and Cortez Hills, a combination underground/ open pit mine. Heap leaching technology was a major breakthrough because it significantly reduced gold recovery costs (versus traditional cyanide leaching – see section below on gold recovery costs) for low-grade but high-tonnage “Carlin deposits” such as those found in Nevada. An example of a low-cost, high-margin Nevada producer is the Marigold Mine. Owned by SSR Mining (TSX:SSRM), Marigold stands out for its ultra low grades of .46 g/t. In production since 1989, Marigold is a large run-of-mine operation. After blasting the ore, it doesn’t need to be crushed or ground and can go directly onto the leach pad which significantly reduces costs. In the third quarter Marigold reported an AISC of $965/oz, after realizing a gold price of $1,207/oz. The strip ratio is the amount of waste rock, or overburden, that must be removed in order to get to the mineralized rock (ore). The strip ratio is calculated by dividing the thickness of the overburden by ore thickness. Eg. if the overburden is 100m thick and the ore is 50m, the strip ratio is 2:1. The lower a strip ratio, the more profitable the mine will be, since less material needs to be moved. High-grade gold contained in narrow veins that snake through the rock can only be mined by excavating shafts and hoisting the ore to surface via low tunnels (drifts). This process is expensive, because digging deep requires a lot of material to be removed around the veins so that the mining equipment can access them. Consider a typical quartz vein that is 0.5 meters wide. At minimum another meter must be added to the vein to mine it. The width is now 1.5m. But logistically, in order to drill, blast, and muck the ore, the vein width must be stretched to 3m. This means the deposit, first estimated at 10 g/t, is now only 5 g/t because the gold has been “diluted” by the waste rock. Dilution can drastically affect the economics of mining the deposit. Rock that was originally estimated at $420 a tonne is now worth $210/t – cutting the internal rate of return (IRR) and the net present value (NPV) in half. Underground mining is highly sensitive to gold prices, considering the high operational costs. A good example is Nova Scotia, where a long history of small-scale high-grade underground mines never turned a profit. No one thought it was possible, but Atlantic Gold (TSX-V:AGB) has shown that open-pittable, disseminated gold is not only possible but a highly profitable business in Atlantic Canada. Its flagship Moose River Consolidated (MRC) project – the first open-pit gold mine in Nova Scotia – opened just over a year ago. The mine plan entails a very low strip ratio (0.76:1), which means every there is very little waste ore to help keep costs low and gold production high. At full build-out AGB expects to produce about 200,000 ounces a year. At AISC of $528 an ounce at today’s gold price of $1,250/oz, Atlantic Gold’s profit margin is a remarkable $717/oz. Unlike the gold majors at the top of the mining cycle, whose mantra was “more production”, AGB is running the MRC mine like a business – keeping costs in line with revenues. Moose River generated profits of $6 million in the third quarter. Along with a low strip ratio, the other factors helping Atlantic Gold control costs are: the mine’s close proximity to labor, suppliers and the airport; a 1.5 g/t grade; and ease of gold recovery. 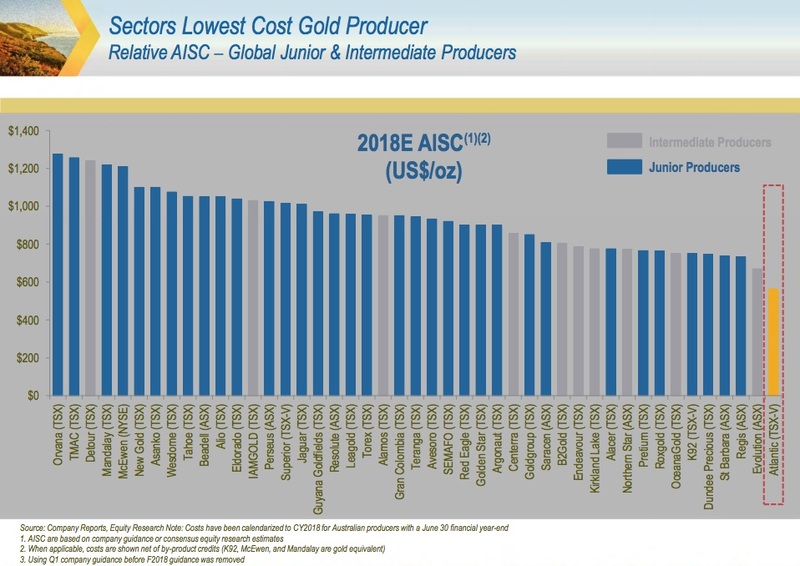 In fact, Atlantic Gold is currently the lowest cost gold producer. The highest-cost mid-tiers have AISCs of between $1,200 and $1,300/oz. The company is often singled out as a benchmark for under-valued companies, considering it has one of the highest market values and EV/gold resource ratios amongst its junior producer peers. Infrastructure: There are hundreds of gold deposits around the world that will never be developed because they lack access to infrastructure – power, water and roads – making them too expensive. Both exploration companies and investors should recognize this at an early stage as a possible fatal flaw. Mines located close to population centers do not need to fly workers in and out, their supply lines are short, and they can tap into an existing electricity grid rather than paying for a new power line and servicing it. According to a study by Mining Intelligence, electric power can be three to four times more expensive at a remote mine; diesel fuel, explosives and lubricants are up to 60% higher. Camp facilities, fuel storage, helicopter staging area, etc. can increase the labor force by up to 25%. Gold investors should also consider the country where the mine is located. Some are more costly than others. Mining Intelligence ranked them according to jurisdiction. Labor: Labor represents the largest component of a mining operation, 53% according to SRK Consultants. In Canada the mining industry has the highest wages and salaries of all industrial sectors, with the average annual pay exceeding $110,000. The industry is experiencing a tighter labor market, as college and university graduates enter other fields. Barrick reportedly paid $304 an ounce for labor in 2015 compared to $192/oz in 2010. Of course, labor costs are cheaper in some countries, and when combined with a weak currency, this can significantly widen a company’s margins. In contrast, rising currency values versus the US dollar squeeze margins. Gold recovery costs: Extracting gold from ore can be complicated and countless mines have failed because they did not recover enough gold to balance input costs. The most commonly used process to extract gold is cyanide leaching, based on a chemical reaction first identified in 1894 by L. Elsner. A slurry of ground ore is mixed with cyanide in the presence of activated carbon. The carbon adheres to the gold, which is then stripped out at high temperature and pressure to form an electrolyte solution. Gold bullion is recovered from the electrolyte by electrowinning. As I mentioned above, low-grade gold mines have taken advantage of low cost heap leaching if the ore is oxidized and amenable to this treatment. It’s often cited that global reserve grades have rapidly decreased so any technology which lowers the cost of gold recovery is critical to industry’s survival. Factors that go into heap leaching's lower capital and operational expenditures include: simple design and equipment, rapid payback, lower energy and water requirements, and less environmental concerns including no tailings disposal. Refractory ore is more difficult and expensive to process due to the presence of sulfide minerals, which block the cyanide solution. Even with a large mineral deposit, the metallurgy can be challenging if the ore is refractory. For example Chesapeake Minerals’ Metates project in Mexico is considered one of the largest gold-silver-zinc reserves in the world, at 18.5 million ounces of proven and probable gold. But the ore is double refractory, meaning the gold is locked within the pyrite and contains a lot of carbon. Breaking the gold free requires both physical (ultra-fine grinding, autoclaves) and chemical processes that are energy-intensive and costly. host rocks, gravity concentration devices create movement between the gold and host rock particles in a way that separates the heavy from the light material. Going back to the same real-world example, 60% of Atlantic Gold’s ore is gravity-recovered before cyanide leaching. Gold mines with the six factors just outlined are likely producing gold at a lower per-ounce cost than their competitors – bulking up their margins especially if the gold price rises and their costs do not. The lesson for investors is clear: don’t make the mistake of judging a mine purely by its production numbers and grades. Of greater importance are a healthy cash flow and low cost structure, which allows a company with capital discipline to reap the rewards of a high gold price when times are good, but protect its margins when the price takes a hit. About the author: Jack Graham has more than 20 years of experience as a writer and editor specializing in Canadian small and micro-cap stocks.